RecoveryLounge...where recovery is a priority...and a pleasure. AT’s & athletes alike know the constant rigors of training will break the body and muscles down before building them up. One of the most under-appreciated aspects of the training formula is recovery and it’s often this very distinction that separates the top athletes from the pack. How you recover after every training session and competition makes a big difference in your performance the next day. This is why elite sports teams have been establishing an environment where recovery is a priority...and a pleasure. With over 25 years of experience behind our true gradient, sequential pneumatic compression devices, RecoveryPump® has defined and continues to set the standard for aggressive muscle recovery. Work with our recovery specialists to design the perfect RecoveryLounge® for your athletes. Choose from a variety of our versatile garments to find which products best suite your athlete’s needs. With the help of our designers and Recovery specialists, you can plan out your recovery tools, layout & customizations. You and your team can start experiencing the benefits of a RecoveryLounge® in just 3 easy steps! RecoveryPump® sets the global standard for advanced dynamic compression with unique features and a versatile garment selection. Our garment selection unlike anyone in the market! 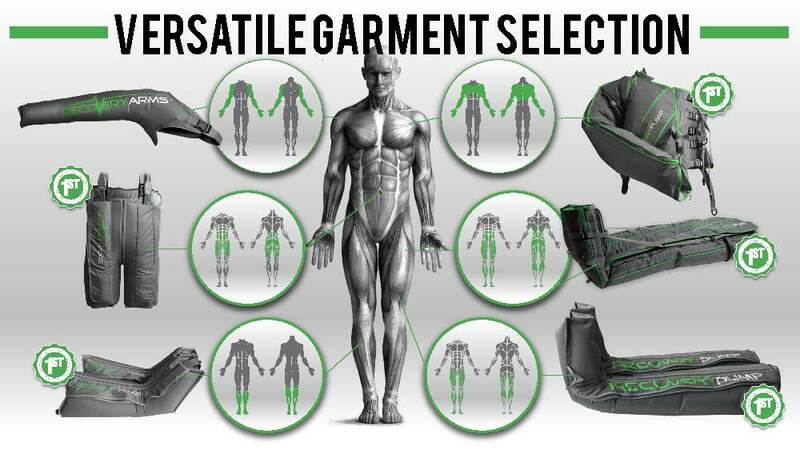 Our innovative garments help you to target muscle groups ranging from toes to shoulders and everywhere in between. Our designers can help you plan out your space with virtual 3d layouts of your potential recovery room. Why not fill your recovery environment with a little team spirit! Customize the Luxe Lounge Chairs with your logo, add a custom designed wall wrap and more! Let’s make recovery a priority and get your team set up with a RecoveryLounge® today!